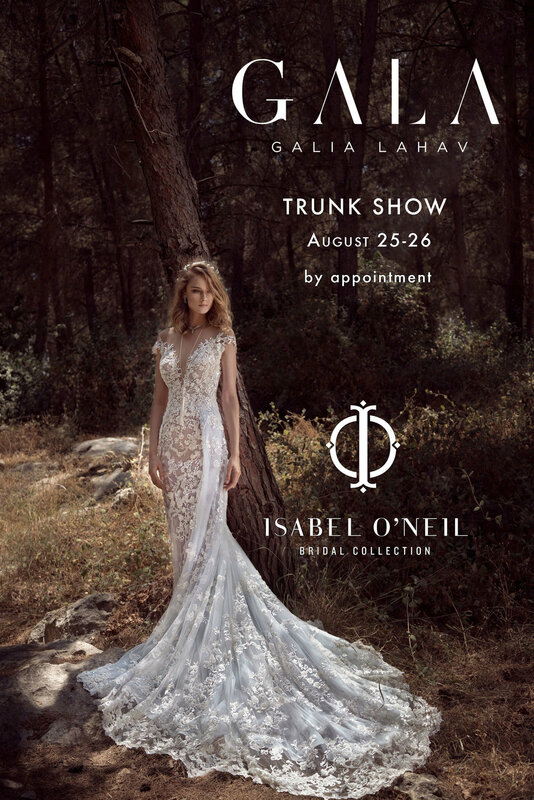 We are so excited to be hosting the GALA Galia Lahav Bridal Trunk Show next weekend, August 25th-26th! GALA is couture designer Galia Lahav's gorgeous made-to-order bridal line, for the young style-savvy bride. It is handmade with loving care in Tel-Aviv, Israel and the quality shows! The newest collection, GALA No. IV is an "urban-boho bridal look and feel" The designs are a mix of a boho chic style with simple lines, defining the female form and adorned with stunning details, embroideries, and lace appliques which embody the unique look of Galia Lahav. Tampa Bay brides have the exclusive opportunity to shop the newest collection of wedding dresses from Galia Lahav and enjoy special incentives only available during next weekend's trunk show at Isabel O'Neil. Appointments are going quickly, so make sure to schedule yours by calling us at 813-251-1749, emailing info@isabelbridal.com or booking online. We look forward to meeting our next Galia Lahav brides!